Cartes de visite and cabinet card photographs of notable buildings and places in Maryland are always exciting to find. 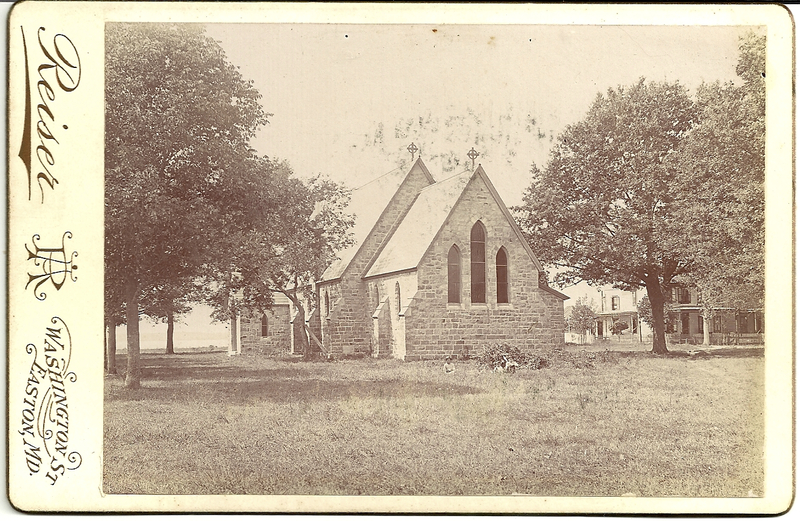 This cabinet card by Aloise Reiser of Easton, Maryland depicts the one of Talbot County’s better known churches, the Episcopal Church of the Holy Trinity on South Morris Street, Oxford Neck. According to the church’s brief historical sketch, wealthy Talbot County landowner General Tench Tilghman of Plimhimmon was the driving force behind the establishment of a third church in the parish in 1852, but the war and the population loss brought about by the closure of the Maryland Military Academy left construction to languish incomplete until the end of the nineteenth century. The building, designed by influential ecclesiastical architect Richard Upjohn, was completed in 1894. According to Kelbaugh’s Directory of Maryland Photographers, the photographer, Reiser, was working in Easton from 1894-1897, so it seems plausible to suppose this photograph was taken during that period. An Aloise Reiser, born about 1868, Bavaria, is listed in the 1880 census of Chapel, Talbot County, Md., son of carpenter Johann Reiser; this is the only trace of the photographer I have found in vital records. In Where Land and Water Intertwine: An Architectural History of Talbot County, Maryland, historian Christopher Weeks says the church was completed and dedicated in 1892, without “the tower called for in Upjohn’s original plan” (Weeks, 212). This view is from behind the church, looking in through the windows above the altar and chancel. The Easton Diocese of the Episcopal Church has a small modern photograph that offers a slightly fuller view of the church from a similar angle.